Ekasapti, Ilona (2005) Penyesuaian Diri Wanita Karir Tingkat Manajerial Pada Masa Pensiun. Skripsi thesis, Universitas Tarumanagara. Achieving managerial level can be seen as symbol of independency, financial security, and self-existence for a woman. When they retire, they will loose all the status and power that they used to have and they have to start a new life. Entering a new life can bring crisis to individual because they loose their position in the office, their income and their colleagues in work. They also have to get adjusted effectively with their retirement processes. This may create problems in retirement. 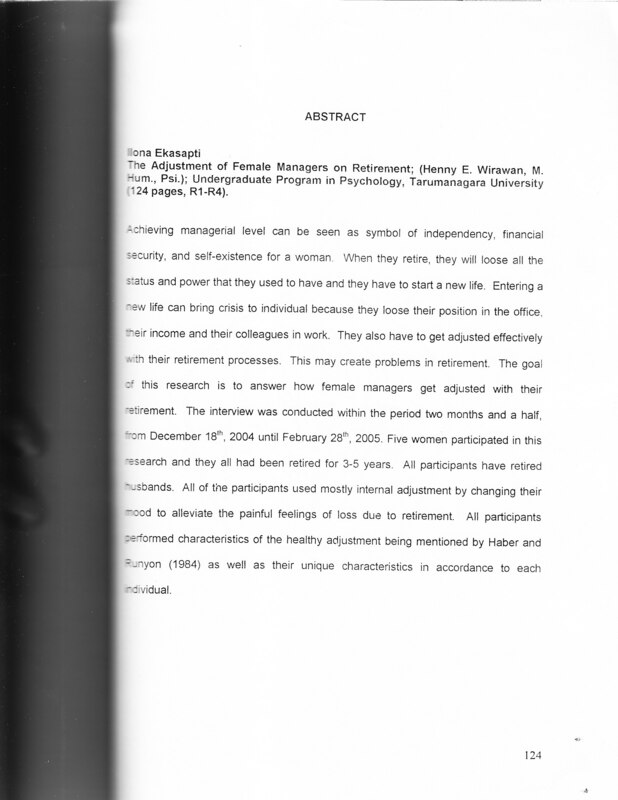 The goal of this research is to answer how female managers get adjusted with their retirement. The interview was conducted within the period two months and a half, from December 18th, 2004 until February 28th, 2005. Five women participated in this research and they all had been retired for 3-5 years. All participants have retired husband. All of the participants used mostly internal adjustment by changing their mood to alleviate the painful feelings of loss due to entirement. All participants performed characteristics of the healthy adjustment being mentioned by Haber and Runyon (1984) as well as their unique characteristics in accordance to each individual.